Revolutionize mobile prospecting with behavioral and demographic insights on the go! With the app, I have fostered great conversations and have built instant rapport with homeowners and clients while on the go. - Steve Kunkel, KW Realty. We released our second generation SmartTargeting mobile iOS app! It's now optimized for the iPad and includes demographic insights. SmartTargeting for mobile is the first prospecting app that arms real estate agents with detailed behavioral and demographic insights on homeowners; in addition to housing and loan information on each home in your prospecting territory. 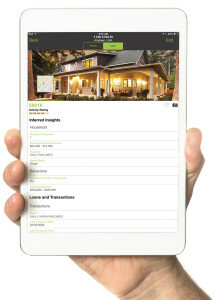 The new app instantly displays insights at a glance that can spark informed conversations and authentic connections between agents and homeowners. When combined with SmartZip's predictive analytics that identify homeowners with the highest propensity to sell their home, the new mobile app gives our clients an unprecedented advantage in growing their listings business.